Homz N Space, a Bangalore-based partnership firm that runs a review-based real estate advisory and brokerage portal by the same name, is looking to expand internationally to cater to non-resident Indians who wish to buy property in India. Harish Achar Brahmavar, co-founder at Homz N Space, said that the company is keen to establish discovery centres in the US, Australia, Singapore and other countries through partnerships with local Indian builders. These discovery centres would showcase key real estate projects in India and would help NRIs with their purchase decisions. The falling rupee and the lull in the property market in many cities has made Indian properties an attractive asset class. Last year, India World Technologies Pvt Ltd, the company behind the real estate broking portal IndiaHomes.com, had acquired UK-based Unesta Homes Ltd, which offers residential sales, property management and commercial investment services to NRIs and persons of Indian origin. Homz N Space seeks to differentiate itself by offering real time counselling and guidance through the house buying process. 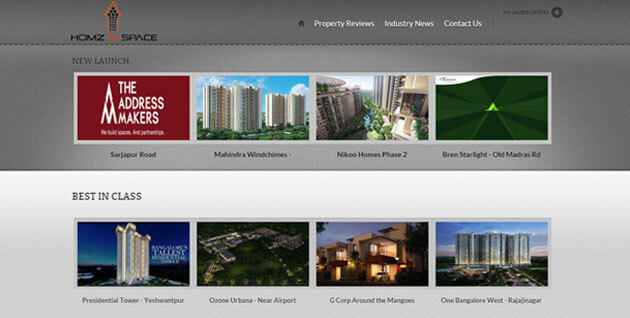 It also provides a discussion forum where top builders participate in clearing doubts that home buyers would have. It operates in the premium segment and only engages with larger builders. Co-founder Brahmavar himself responds to house hunter queries online. The reviews are based on a list of parameters such as builder's credibility, history, quality of materials used, master plan, expected possession, location, surrounding developments, amenities & features and price details. The five-member company, which operates in Bangalore and works with the top 30 builders there, plans to expand to other cities soon. Brahmavar said the company is redoing its website to feature exclusive offers from all top builders, which he claimed is a first for any real estate portal in the country. "We are currently focusing on transforming our current web technology to provide better user experience and are recruiting more number of sales consultants to double our sales," Brahmavar said. Homz N Space claims that it has received more than 20,000 user reviews, created over 7,000 user engagements and has attracted 1.8 million views on the website since starting up in July 2011. It claims it has brokered 321 actual property sales transactions so far and has generated revenue of Rs 4.5 crore to date. While its services are free for buyers, Homz N Space takes two per cent of property value as commission from builders on completed deals. This is similar to what offline property brokers charge as fee. Brahmavar said the company is looking to raise $5 million (Rs 30.5 crore) from potential investors to support its expansion plans. Homz N Space was founded by Brahmavar and Raghu Valekar. A real estate investment consultant, Brahmavar holds an MBA in marketing & IT from IFIM Business School (Bangalore) and a BBM degree from the University of Mysore. He heads the technology division and leads the expansion plans. A civil engineer with an MBA, Valekar steers sales strategy, operations, financial planning and builder relationship management. Homz N Space competes with the likes of IndiaHomes and PropTiger in the property brokerage space besides other property search sites Housing (now also runs a separate property market discussion forum), MagicBricks, CommonFloor and others for a slice of the crowded online real estate space. Last November, global media giant News Corp picked 25 per cent stake in PropTiger.com for $30 million. In March 2015, New Corp acquired the parent of this news website.